I’m actually ecstatic that I’ve seen most of the movies that were nominated for SAG awards before I got the screeners. This just means I’ve seen a lot of good movies in theaters this year, I suppose – something I couldn’t say last year, when I’d only seen two or three of the nominated films. Which is pretty sad when you consider I really really love movies and want to like, act in them and stuff. What’s been among your favorite movies this year? Nothing’s really pulled ahead of the pack for me, except for possibly The Descendants, but maybe that will change once I’ve seen all the nominated films. Kind of surprised the final installment of the Harry Potter films wasn’t nominated for Outstanding Cast, for the unprecedented achievement of keeping the (mostly) same group of actors around for a decade, if nothing else. Yay! I had a good laugh about Harry Potter Outstanding cast comment – I completly agree. And while I appreciate a new good movie as the next guy, Im not ashamed to admit that last year comics movies dominated my appetite. i mean, seriously – i can’t even think of another movie franchise that had such a great cast, for such a long run! and i thought Daniel Radcliffe did an amazing job in that last film; he really held the whole thing together pretty spectacularly. and while last year had some pretty good comic movies, i’m even more excited by this year’s Dark Knight Rises, The Avengers and (fingers crossed) the Spidey reboot! The Academy giveth, and the Academy taketh away . . .
I’ve seen exactly two movies in the theater this year and one of them was The Smurfs . . . Haven’t done so well on the home front, either. Hmmm. How do I get my SAG card, considering I have the acting talent of tapioca, a face for radio, and a voice for mime? what was the other movie you saw, Sarah W? was The Smurfs any good? and you basically get a SAG card by appearing in SAG productions, which is somewhat difficult to do if you don’t already have a SAG card. It was Three Musketeers, for my sins . . . as my husband says, if they wanted to do Jules Verne movie, they didn’t have to involve Dumas. But I liked almost everything but the last five minutes, which I just couldn’t choke down. Oddly enough, my suspension of disbelief didn’t give one twang during the Smurfs. And I loved their battle chant—for those of us who grew up with them, it was actually a bit chilling. I don’t even know what to comment about here… Seeing as the inner workings of Hollywood may as well be Greek to me. Sadly in the Philippines we have this annual film festival where we embarrass ourselves even further by catering to the wants of the masses instead of giving insightful films like the indies. Why is it so bad to “cater to the wants of the masses”? It’s called business. It’s what you do. You make a product that will sell if you want to be successfull. I get tired of people telling me what I SHOULD want when I already know what I like. Sadly catering the wants of the masses almost always produces a mediocre project. i agree with all of you, Jiro/Papa Bear/TPC: not everything produced for the masses is bad, in fact some of it is quite good, but there’s a whole hell of a lot that is, when it tries to cater to every common denominator. although sometimes art/indie films get recognized by the awards organizations in Hollywood, much of the time “the masses” have the biggest say in what gets prizes and what doesn’t, Jiro. so our organizations probably aren’t all that different. I’d say The Help was my favorite non-superhero movie of the year. The best movie was Captain America which I loved to death. Thor was fun and I enjoyed half of Green Lantern. i really liked pretty much all the performances in The Help, TPC. still can’t decide what my favorite superhero movie of 2011 is, though, but Captain America would probably be my pick, too, if put on the spot. i think i’m going to need to watch all of them again to come to a real decision, though. Hey G-Man! Welcome back! Your wit and wisdom was missed. Don’t go away for so long again. *is Jealous! * I would love to get to see all those screeners! That sounds like such a perk of being part of SAG. Did you get a chance to see The Help? I loved it. It was amazing and so well done. Bryce Dallas Howard has such a great range. She is truly impressive. I must say, it’s very flattering to hear (read) you say that, and I feel the urge to say thank you. But I must ignore my urges to congratulate you instead for not drifting as I have. So well done, all of you. It’s not that I got bored, but that I’ve been kept busy at school, and one thing led to another, then I got sidetracked, then distracted, then annoyed, irritated, and somehow read through all of Penny Arcade and Ctrl + Alt + Del. Eventually, I came full circle back to the first webcomic I ever read, and here we are again. yep, saw The Help (just recently, with Mombot!) and i agree: Bryce Dallas Howard was terrific in it! loved her face during the “pie eating” scene. heheh. Most of my movie experiences are at home, so the whole “experience” isn’t quiet the same for me, but thanks to the Wounded Warrior program I did get to go see MI:Ghost Protocol (the best of the bunch so far) and the second Sherlock Holmes movie last week. They were both surprisingly good for action flicks. yep, i liked both of those movies, too, Oz (especially MI:GP.) i might actually have to see that one again and take a friend before it’s out of theaters. and it sounds like the Wounded Warrior program is a pretty awesome thing. cheers to them! I don’t get to see that many movies anymore. It’s mostly because it can be expensive for even just two people to go watch a movie sometimes, but also because I’m not that interested in going to see them anymore. As far as my favorite movie, Sherlock Holmes Game of Shadows without a doubt. Also, how excited would you have been if one of the movies you’ve acted in had been nominated? tell me about it, Fijiman: going to the movies is crazy expensive these days. i generally try and manage that a bit by buying tickets at Costco beforehand. i saw all those movies too, Malkav, and i’ll agree with you on Cowboys and Aliens (worst crime committed by it was that it was just boring. how do you make a film mashing up cowboys and aliens boring!? this film figured it out.) but i have to disagree with you on Apollo 18 – i was actually somewhat engaged with it until the villains turned out to be *spoiler warning* sentient moon rocks. really. Anyway, in response to Malkav, I agree that the Downey films weren’t incredible, but the TV Show, Sherlock, is pretty fantastic. It’s set in the modern day, but it’s got good use of effects, incredible acting, plots that are more or less faithful to the original books, and it’s written by Steven Moffat and Mark Gatiss. If that isn’t enough to get you to try it, I don’t know what is. I know I could have hit “Reply”, but I was saying that generally as well. If it gets anyone else interested, that’s all the better. that show Sherlock is tops on my list of tv shows i must watch, G-Man0091. hoping to make time for it soon. glad to hear you dig it so much. It is just incredible, and a my whole house (at school, not home-house) agrees with me. I have to say, though I’ve been reading your strip since the beginning this is the first time I’ve had the urge to comment. I really enjoyed Moneyball. It’s probably my favorite sports movie ever. And I love me some sports movies. I grew up in Oakland at the same time as the events in the movie. It is incredibly accurate and the acting- while not the best I’ve ever seen- really added depth and dimension to a story that baseball historians and sports buffs know so well. 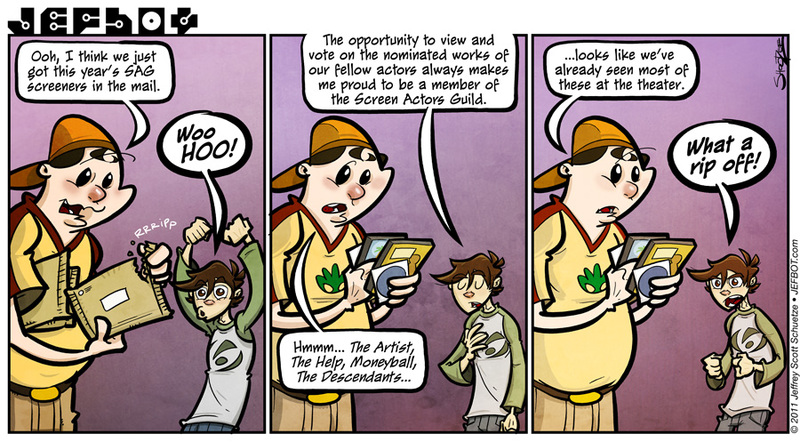 well i’m happy this strip brought out the urge in you to comment, Starky, thanks! i agree – the acting in Moneyball was pretty terrific for the most part, and that’s pretty cool that the movie resonated with you, what with your connection to Oakland and all. i found it pretty fascinating, the whole “stat” angle it presented. kind of like a baseball RPG. surprised someone didn’t employ those theories to recruitment earlier. You could always try to “sleep” through them again! LOL. I was bummed too! Moneyball was cool. But aside from that it’s been a dud year! i’ve actually found a lot to like this year, FunnyShaffer, but there has been a number of movies i’m “supposed” to like (Martha Marcy May Marlene comes to mind) that have just left me cold. I can’t remember what I’ve seen besides Harry Potter. That’s a bad sign isn’t it? not too bad a sign, Shanna – at least you picked a good film to remember! and bot does look rather apish with his woohoo face, doesn’t he. heheh. Only movies I remember going out to see were Captain America and The Muppets. Last year is a flipping blur now. Regardless, those two movies were fantastic. The Muppets had a lot of cheese in it, but it’s the best kind of cheese anyone could ask for!! yeah, 2011 went by way too fast, TCG. let’s hope things slow down a little this year, sheesh. and The Muppets was pretty fun – i had a great time seeing that one, too. I would have to go with New Years Eve, Tintin and the secret of the unicorn, and Sherlock Holmes: A Game Of Shadows. (Mostly because those are the ones I remember best at the time…) New Years Eve really spoke to me… I think I am going to make the best of this year even if the world doesn’t end. I am actually going to take a summer job, REALLY try to get a BF, and try to find out if there is life on other planets (dont write any mean comments, or I will make the aliens kick your sorry asses when they come!)! i skipped NYE, DAS, and you’re the first one i’ve heard that’s seen and liked that one, so count me as surprised! (i always like to hear when people have a dissenting opinion.) i never saw Valentine’s Day, either, though. was that any good? and if you find evidence of life of other planets, please let me know. I saw both Harry Potter DHp2 in theatres along with Hugo. Both were really good. I still need to see WarHorse. I cannot miss out on a horse movie. i agree: HP:DHp2 and Hugo were both good, and worth seeing in a movie theater. have i mentioned that i was disappointed with War Horse, though? protip: go in with the expectation that it’s a rather violent children’s movie, and maybe you’ll come out with a better impression of it than i did. let me know what you think when you see it. I’m gonna see Red Tails later this month. i hope that’s good, Anime fan! nice seeing Mr. Lucas produce something non-Star Wars related, although the trailers haven’t done anything for me, so far. i’m sure i’ll check it out, though. I can’t wait until the next Underworld movie! I hope that they didn’t drop the ball with this one. I’ve seen so many good series fail because of one poor movie. It would be such a shame if that happened with Underworld. As far a previews and reviews? I’d prefer to go to San Diego Comic Con and see all the previews they show there. That con is EPIC! i’m hoping they turn out something good with the new Underworld too, KB! getting Kate B. back’s a step in the right direction, for sure. Wish I COULD go. I can’t afford air fare, much less the con tickets and hotel room (Maybe a roach motel). This looks like a job for a ROUNDHOUSE KICK! Just saw Don’t Be Afraid of the Dark. I will now be hiding under my covers thank you! ooh, i wanted to see that movie, Pixie, but missed it during its theatrical run. i’ve heard pretty mixed to negative reviews on it, but Guillermo del Toro writing and producing means that i’ll see it sooner or later. glad to see it got under your skin! When are we watching “The Descendents” with the familia? I don’t think I did my share of movie-going last year. I’ll hafta do better this year. Oh wow that is a rip off, moneyball was great!